Tamara Cohn Eskenazi has a special place in contemporary biblical scholarship. Among the first to bring a focus of scholarly attention to the period of ancient Israel’s creativity after the Exile, she has also been a leader in foregrounding the Jewish tradition within the interpretative discourse of biblical scholars. And as a woman scholar, she has advanced the study of issues in the Hebrew Bible that impinge on the concerns of women ancient and modern. Tamara Eskenazi was awarded the 2008 National Jewish Book Award for her volume The Torah: A Women’s Commentary and the 2011 National Jewish Book Award in Women’s Studies for her commentary on Ruth in the Jewish Publication Society Bible Commentary series. 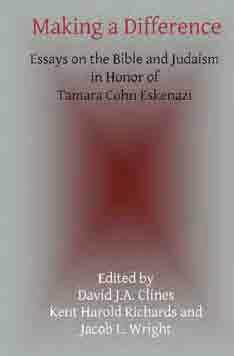 The 26 articles offered to Tamara Eskenazi by her friends in this volume represent the range of her interests in all things biblical and Jewish. From the Book of Genesis to the New Testament to modern Hebrew fiction, from technical studies on the prophets or Qumran to penetrating insights on her beloved philosopher Levinas, this volume beautifully represents the range and depth of Jewish culture. Kent Harold Richards is Emeritus Executive Director of the Society of Biblical Literature, Professor of Old Testament, Emory University, and Pastor, First United Methodist Church, Mystic, CT.
Jacob L. Wright is Associate Professor of Hebrew Bible at Emory University. Farewell to ‘Mr So and So’ (Ruth 4.1)?